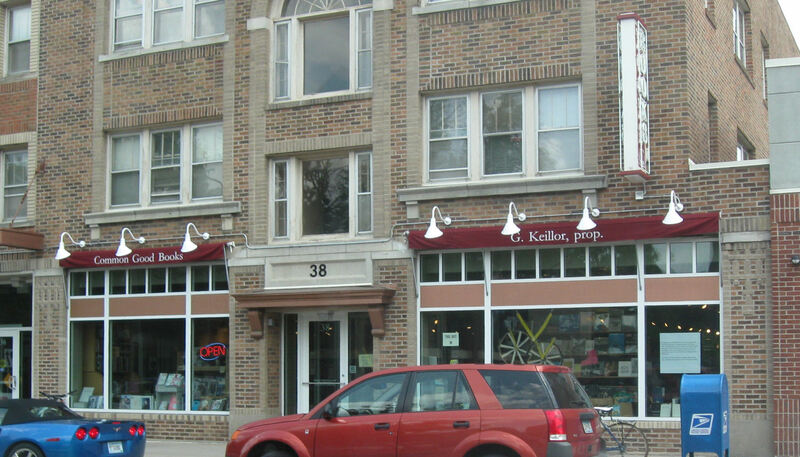 2014 Road Trip Photos #28: The Last Visions of St. Paul « Midlife Crisis Crossover! Welcome to the wonderful world of urban spelunking! Day Six had taken us from the other twin cities of Fargo/Moorhead to a Minneapolis city park with its own 53-foot waterfall, and would end for the evening in Wisconsin. Before we left Minnesota’s Twin Cities for the year, we had one final appointment to keep on Thursday night for a tour that sounded interesting and offered limited windows of opportunity, but came with a catch that we weren’t aware of till after we arrived. 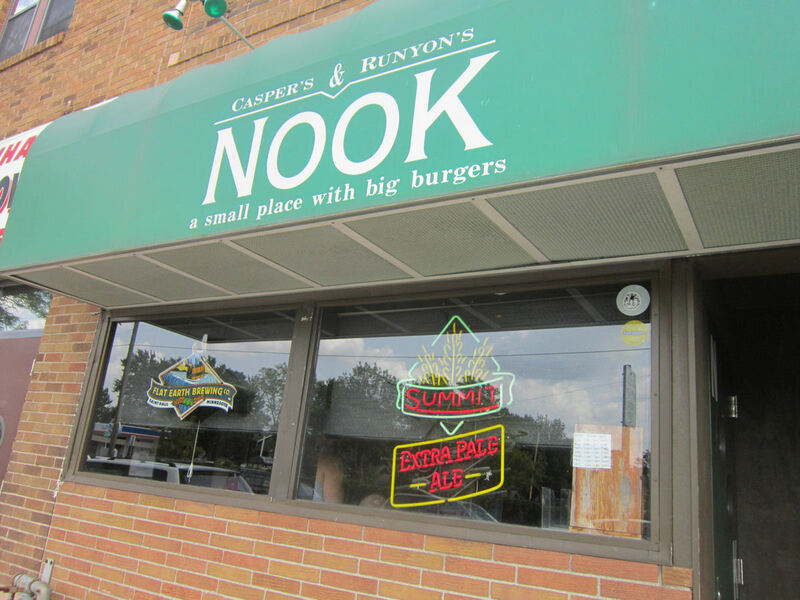 After the Hjemkomst but before Minnehaha, we stopped for lunch at one of several burger joints on my list: Casper’s & Runyon’s Nook. Yelp classifies it as a “dive bar”, which may or may not explain why it’s appeared in three episodes of Diners, Drive-Ins & Dives. I’m not sure why I drove us here over the other options. Either the directions were easiest, or the other restaurants were farther out of our way. We have nothing for or against Guy Fieri — I copied down a lot of referrals from foodnetwork.com without verifying their sources. 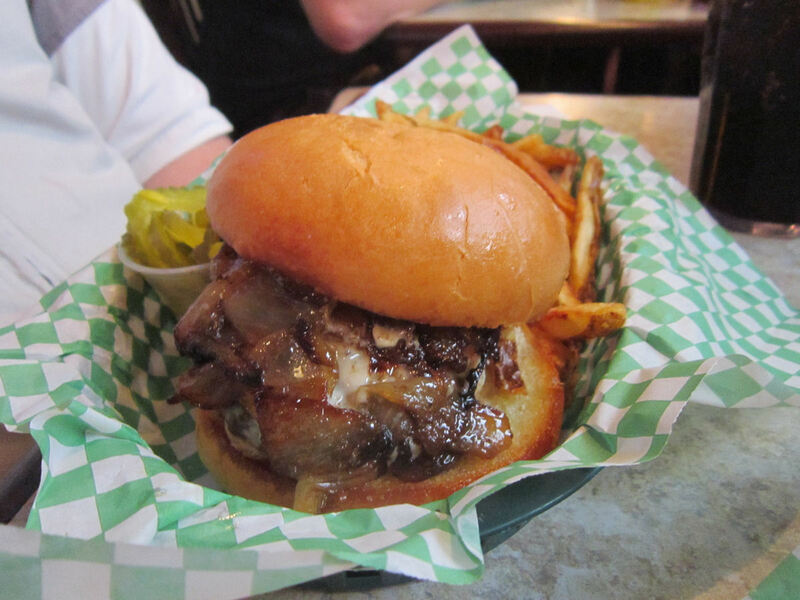 My burger of choice: the Paul Molitor, which had pepper jack cheese stuffed inside the patty. The lunchtime service wasn’t the speediest, and I just now Googled “Paul Molitor” to confirm he’s one of those millions of sportspeople I don’t know. Regardless, we were fed, and that’s what counts. Googling didn’t get help me get the reference. Does the real Paul Molitor love pepper jack cheese? Or does he have a mildly spicy personality? Whatever that would even mean? On our way around town we passed what sounded like a bookstore with an interesting backstory. I snapped this while driving and wished we’d had time to stop and browse. I’m not into Garrison Keillor’s Prairie Home Companion, but I know people who are. Oh, the anecdotes I could’ve shared. Between lunch and appointment, we had time enough for that aforementioned stop at Minnehaha Falls. 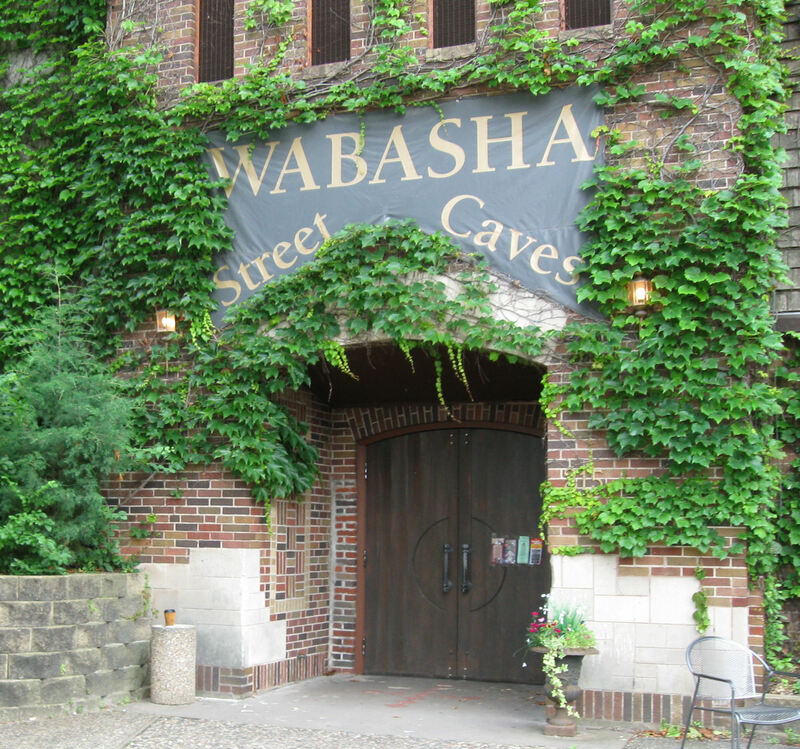 From there we headed due east from Minneapolis to St. Paul for a tour of the Wabasha Street Caves, a set of manmade caves burrowed decades ago into a deep hillside that once served as a speakeasy, as a restaurant, and as off-the-books Mob storage. Their limited schedule only allows for basic historic tours on Thursday nights and weekend mornings. The concept sounded cool to us, but we wouldn’t be in town on a weekend. Hence our targeting a Thursday visit, and arranging our week’s entire schedule around ensuring our presence at that very time. A few items were awkwardly rearranged (e.g., our anniversary dinner), a couple of potential sights had to be cut (e.g., the Minnesota Sculpture Garden), and at least one coulda-been spontaneous contender was never meant to be (cf. Common Good Books), all because we wanted to check out those cave interiors. After Minnehaha we arrived a bit early with time to kill, and the attendants weren’t there yet. 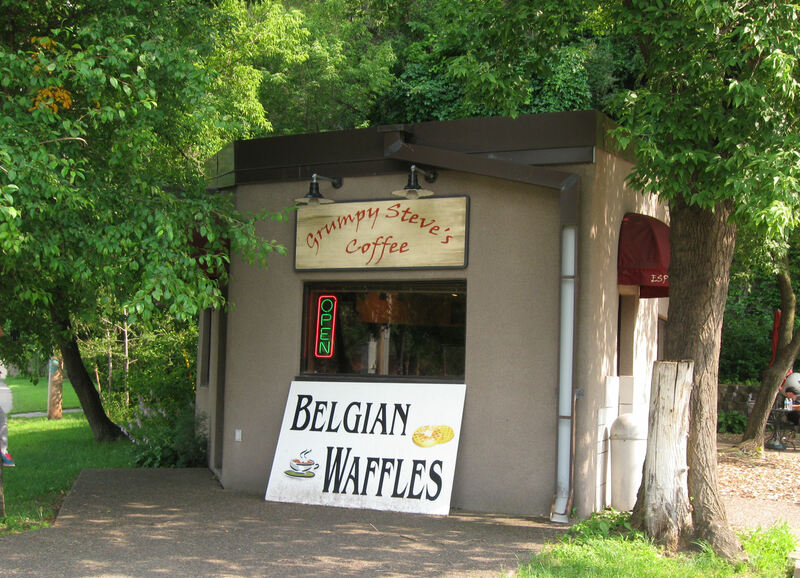 Out front is a cozy coffee shop with a decent snack lineup to pass the time. My wife was content with her peach smoothie, and I can vouch for their white chocolate raspberry latte. Everywhere we went, Caribou Coffee joints seemed to outnumber Starbucks 5-to-1, but Grumpy Steve’s was the only place I had an upgraded coffee all week long. Go figure. Eventually the tour personnel arrived, tickets were sold, our group was gathered, and the tour officially commenced. Once inside, our introduction to the Caves included a surprise instruction that appeared nowhere on their website or in any related literature: all of us present were asked not to post any pics online for “copyright” reasons. They didn’t mention anything about the exterior. 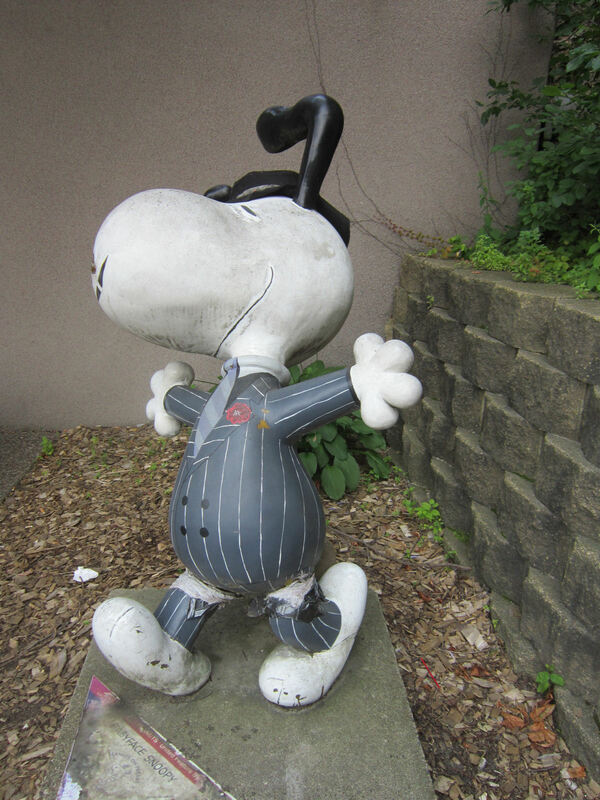 Please enjoy this photo of the Roaring ’20s Gangster Snoopy sculpture that stands guard outside the Caves’ entrance. I presume his missing nose was a wound inflicted upon him when Charlie Brown was thiiis close to share deep cavern secrets on Twitter. As seen in the canceled TV special “It’d Be a Real Shame if Something Happened to Your Dog, Charlie Brown”. Don’t get me wrong: my wife and I had a blast. Our tour guide was a talented local actress working from a great script and/or a solid improv background. 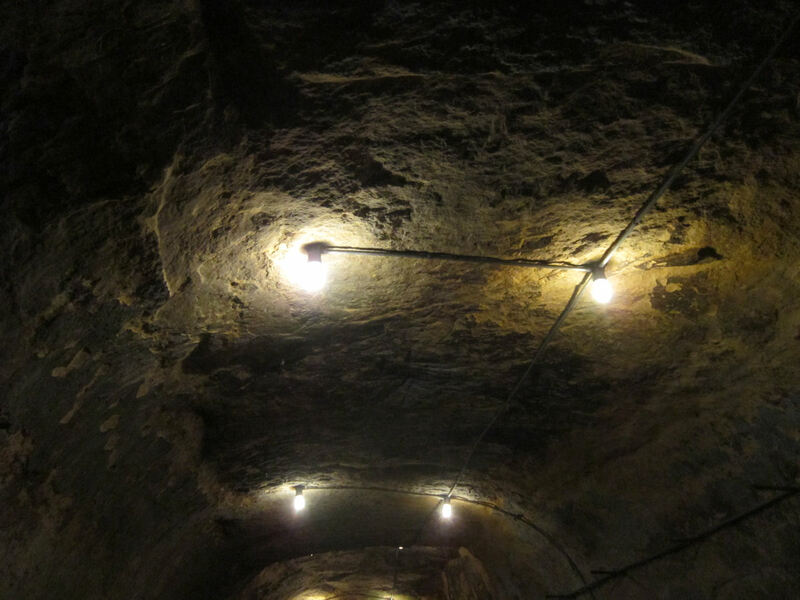 We weren’t bored, the interior spaces — many of which remain more like formerly inhabited rooms than like featureless cave chambers — had some interesting things going on, and I recommend it if you’re in the area at precisely one of the three right times. That being said, my preference for sharing the experience as a coordinated effort between both words and pictures is apparently restricted, not unlike our visit to the Star Trek Experience inside the Mall of America. What we enjoyed in person loses a few levels of fun and interest in the sharing with You, the Viewers at Home. They didn’t tell us we couldn’t take notes. They didn’t forbid us from storytelling. However, if they’re not too keen on being visually promoted through social media, blogs, and other common 21st-century word-of-mouth tools, I suppose we shouldn’t spoil all the verbal aspects of the tour, either. To that end, please enjoy this transcription of the notes I took during the tour, presented here without sentence structure, rewriting, context, art, or other amenities I’ve granted nearly every other chapter of this series. Someday when you go on the tour, all of this foreshadowing will make more sense in hindsight. on Nat’l Register of Haunted Places! 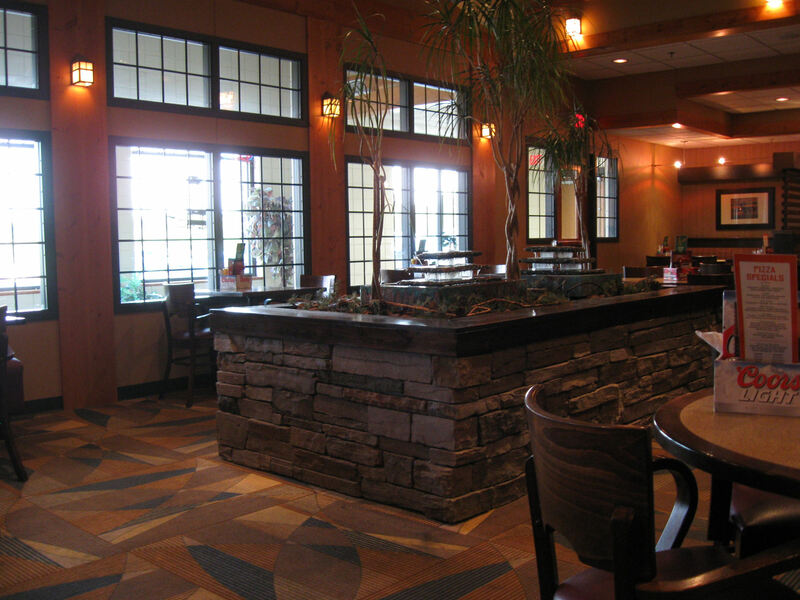 has a bar! pd for by Anheuser Busch! …and now you have some insight into my note-taking process. Yes, I’m more flagrant with exclamation marks in my notepads than I am on this site. Yes, I’m aware that’s “saying something”. Also, my wife reminded me the other day one of our fellow group members was an elderly lady who said she’d once been to the restaurant-that-was and was asked to dance by a gent she learned after the fact was John Dillinger. So they’ve got that going for them, if the tour guide wrote it down for future use. As a symbol of general cave ambience, please enjoy this photo of a random cave ceiling with artificial lighting. Indiana has several deep, stabilized caves statewide where unskilled commoners like us can parade through, take photos, and gab about them at length to anyone who’ll listen. This may or may not be a cave ceiling of any real significance. Photo possibly taken by some anonymous punk kid who should totally be tracked down and shamed. Darn those anonymous punk kids. The end of the tour also signaled the end of our time in Minneapolis/St. Paul. We took Wabash Street back over the Mississippi River, headed into downtown St. Paul once more, spent 10-15 minutes weaving around an ungodly amount of road construction, stumbled across I-90, and eventually exited Minnesota itself. By and large, we considered our Twin Cities encore time fabulously spent. Alas, St. Paul. You and your twin will be missed once more. But our vacation wasn’t over yet. Home was over a day away by our standards. We stopped for the night at a Sleep Inn in Eau Claire, attached to a combination truck stop/mini-mall that stood in the middle of nowhere and seemed rather new. We had late dinner at their in-house non-fast-food establishment, the 29 Pines Family Restaurant. From our perspective, nothing about the 29 Pines interior read “truck stop” to us at all, though we’re hardly truck stop authorities. Either way, the fountains were a nice touch. As each road trip winds down, we often find ourselves unconsciously transitioning from food experiments and weird establishments to calmer, safer dining options. Sometimes it’s budgetary, sometimes it’s an unspoken yearning to return to the mundane. All I can tell you for certain is I was perfectly fine with my meatloaf dinner. With one more day and another 500 miles to drive, our vacation remained…To be continued!